We’re happy that we’re able continue our annual two-week stay in New York in May each year. Each time, we visit, New York feels more like home. For those not accustomed to New York, this might be a good starting point for planning your visit. For old hands, maybe a few new ideas or reminders of places to revisit. Click on the links in blue for more about each place. Susan, as usual, was the Ring Mistress if this trip. We chose four plays rather than just going to see Hamilton for $1,000. That was probably a mistake. We only ate at one “name” restaurant, Babbo, a regular stop for us, rather seeking out places with entrée’s in the $20’s not the $30,s or more. We encountered a wide range of museum exhibits. We were busy the first week and less so the second. We didn’t get up and out so much in the morning, more like home. And walked – 90 miles over 14 days. Only took cabs to and from Penn Station and to the Met on one rainy day. Over two weeks we visited 11 museums and libraries, viewing both special exhibits and works from the museum collection. I can hardly begin to describe these shows, so click on the links to see more about each museum and exhibit. The depth and breadth of what we were fortunate enough to see in just two weeks was wonderful and probably not possible in any other city in America or maybe the world. Rooftop Terrace – The Theater of Disappearance – Adrian Villar Rojas – This piece fills the rooftop terrace with castings made from pieces in the museum collection arranged in fascinating juxtapositions. Housed in the former home of Henry Clay Frick, turn of the centruy steel industrialist on the Upper East Side. Turner’s Modern and Ancient Ports: Passages through Time – Though this exhibit has already closed, two of the significant pieces are from the Frick collection. From the collection – 3 Vermeer (the most on display in one place), Rembrant, Frans Hals and others. The Whitney Museum moved from it’s upper west side location several years ago to a site on the Hudson River in the Meatpacking District at the southern end of the High Line. Biennial – Every two years, the Whitney commissions this exhibit of American art. This exhibit fills most of the museum including the stairwells. We visited the newly renovated Main Reading room open after two years work. As a way to experience the room, rather than just walk in and out, we both picked out books from the shelves, Minoan Archaeology for me and an Encyclopedia of Ancient Greek for Susan and read for an hour. Then we walked and shared all the arcane information we had just learned. Pierpoint Morgans 1906 Library – Even in a brief visit, the scope and importance of the collected works is apparent. Georga O’Keefe, Living Modern – O’Keefe’s art, fashion life and photos by husband Alfred Stieglitz and others. Part of the Smithsonian, the Cooper Hewitt has a unique interactive presentation with electronic wands that allow visitors to record their visit and view their selected pieces on line later. You have to take the tour which has limited room and cannot be reserved, so arrive early. Sign up and go for a snack. We didn’t visit the museum this trip but managed to talk our way into the gift shop, which is inside the museum. Three stories of interesting stuff. If you visit the museum, be sure to leave time for to explore the shop. Little Foxes, by Lillian Hellman – nominated for Tony for best revival. Very well done old school Broadway play in which Laura Linney and Cynthia Nixon switch parts each performance, which tempts you to see it twice. 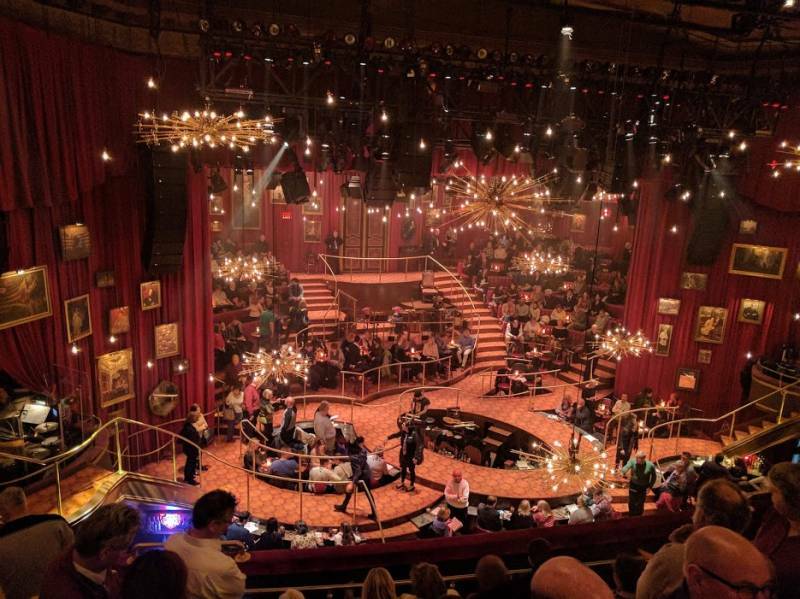 The Great Comet – Based on 65 pages of Tolstoy’s War and Peace, this is an enthsiastic Tony nominated musical. The theater is redesigned. The audience steps up on to the stage, sitting at tables and bars and the actors roam around the audience. New York Philharmonic – A strange pairing of Beethoven’s 9th Symphony, “Ode to Joy” with Shoenberg’s short Survivor from Warsaw with the full orchastra and the Westminister Choir. The rousing reception by the audience may be in part because this was the first of Alan Gilbert‘s farewell series. He is leaving the Symohony in early June. Cassis – Columbus between 70th and 71st – Our first dinner or the trip we went back to Cassis, walking both ways from our apartment on 93rd, just to get our New York sea legs. Cassis is just as good as we remember and could hold its own in Paris. Our waiter, a little cool at first, warmed up and told us he had been there for 16 years. We closed the place at almost midnight. Gabrirla’s Restaurant and Tequila Bar – W93rd & Columbus – Across the street. The food was good and moderately priced. Shake Shack – W77th & Columbus & All over – In the running for best fast food burger and includes wine and beer. Storico – W77 & Central Park West, in the American Natural History Museum – A waiter service museum cafe, a little expensive, a little formal but an enjoyable lunch. La Violiolo – W68th & Columbus, close to Lincoln Center – Dinner after the Symphony, quiet and moderately priced. Playa Betty’s– W75th & Amsterdam, also near Lincoln Center. Very casual, but good food at low prices. 2nd Ave Deli – E75th & 1st Ave, also E 3rd & Lexington – This is the ultimate New York deli. The Grange – 141st & Amsterdam – Good hipster menu at a moderate price, near to the Hamilton Grange in Harlem, or as they now call it, Hamilton Heights. Jack’s Wife Freda – 224 Layafette between Spring & Kenmar – Fun interesting menu with a moderate price. Babbo Ristorante & Enoteca – 110 Waverly Place near northeast corner of Washington Square – Always outstanding. An early Mario Bataglia restaurant. Newer places seem to have captured the sporlight but this place remains relatively unpretentious and reasonably priced for first tier places. Do not let them seat you downstairs, insist on the upstairs diningroom. Barraca – 81 Greenwich Ave @ Bank Street – Affordable Spanish Tapas with street tables. Interesting variety of Sangrias. 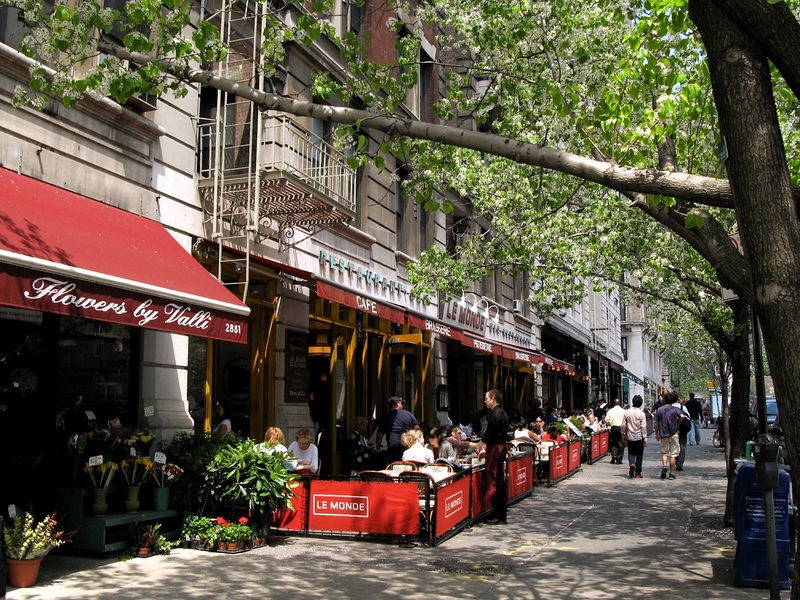 Alta – 64 W 10th Street between 6th & 7th – Moderate – Medeterranian small plates, though not so small. The entrance with not sign is down a few stairs under a typical brick townhouse, but once through the bar it opens into a beautiful high two-level restaurant that was foremrly a foundry and a Quaker meeting hall. The food is very good. The crowd is mostly New Yorkers and popular so reserve in advance. Sister restaurant Cata at 245 Bowery, on our list for next year. Faun – 606 Vanderbuilt Ave, Brooklyn – In the 2017 Michelin Guide. Our New York friends gave a knowing nod when we told them where we went. Samba Kitchen & Bar – W46th & 7th Ave – Small good and busy with reasonable prices. Good location for before the theater. Get there early or make reservations. Gloria – W53rd & 9th Ave – Pescatarian – Newly opened with very good small menu. Also location for before the theater. Make a reservation. Kilare Taverna – W44th between 5th & 6thShopping – Our last night – Kelare is a mirror of how New Yorkers see themselves. New Yorkers who are a little older whiter, executive class. Formal, dark wood décor, white table cloth, attentive maitre’d, all male staff, hint of a deep wine cellar but no sommelier and whole fish nestled in the ice on a large table where white haired men are attended by waiters as they expound on their knowledge of fish, perhaps an expedition in the Greek Islands and make their dinner choice. There are lots of places like this throughout Mid-town. This one is just off 5th Avenue, near the theater district but decidedly not in the Times Square zone. It’s next door to the Harvard Club and down the street from the Algonquin Hotel where tourists sit at the “round table’ trying unsuccessfully to recapture the panache of those who sat there almost a century ago. The food and service was good and only about 25% overpriced. A good place to experience this tradition. On our last subway ride home, we gave our weekly metro passes that still had some valid days to people on the platform. I interrupted a young couple in an embrace. They took the pass, smiled, thanked me and resumed.